Preheat oven at 350 degrees. Melt butter in a large skillet. Add the onion, celery and garlic saute for 4 minutes. Stir in the rest of the juice and oranges, seasonings, pecans, cranberries and mix well. Place croutons in a large baking dish. Pour chicken broth and orange mixture over the croutons. Place in oven for 20 minutes covered, then uncover and bake 15 minutes more. If you make this ahead of time and it dries out add more chicken broth before reheating. I'll bet this gives dressing a lighter touch and the citrus should go well with the turkey. Citrus and turkey go so well together. A great pick. A very creative stuffing recipe. I love the add of mandarin. 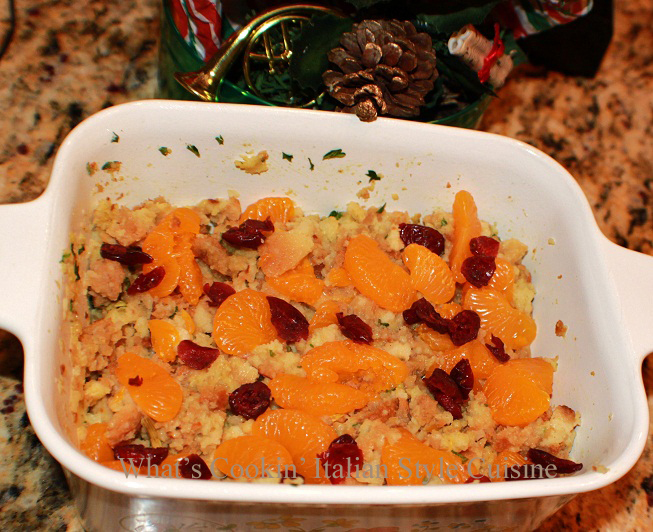 A perfectly delicious looking stuffing…the mandarins sound so interesting! Indeed it's a typical Florida stuffing/dressing. Love the mandarin orange addition! I have never had stuffing with these flavors.Sounds fresh and interesting.